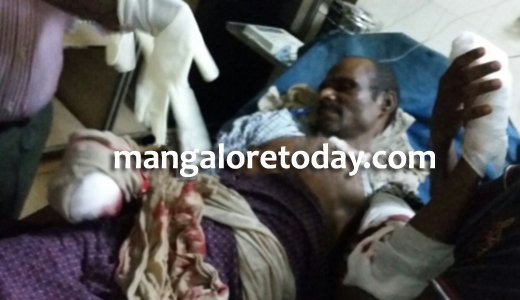 Belthangady: July 27, 2015: In what could be called as shocking incident, a tribal man was attacked and his hands were chopped by his landlord in a fit of ragein Belthangady. According to sources, Sundar Gowda entered into the land of Malekudiya with his aides and chopped off the trees using electric tree cutter. When Malekudiya opposed it, a man pounced on him and attacked using tree cutter to which Malekudiya lost his one hand and four fingers. The assailants also sprinkled chili powder on Sundar’s face and fled away in their car. According to the sources, Sundar Malekudiya was living on a government land with his family for many years. Gowda argued with Malekudiya that the land does not belongs to government instead belongs to him. When the forest department inspected the land, they confirmed that the land belongs to Malekudiya and no other person has right to force him to vacate the land. But Gopad Gowda raised the objection and claimed that it was his land and threatened the family to leave the land. Gowda crossed all the limits and attacked Malekudiya. The locals rushed the victim to a hospital. The police arrived at the spor and have taken up the investigation.